For the first time in more than two weeks and just the second time in a month, the Grizzlies will play a home game. It’s a welcome sight, considering Montana has won 19 consecutive home games, the fourth-longest active winning streak in the entire country. Not that the road has been bad, however. Montana has won three consecutive games – all on the road – snapping the nation’s longest home winning streak (at South Dakota State) before beginning Big Sky play with back-to-back road wins (at Northern Arizona and South Dakota State). During a three-game stretch from Dec. 8-19, Montana’s offense struggled to put the ball in the hoop, averaging just 51.0 points per game. That phase seems to be well behind the Griz, though, as in the three games since – all wins – Montana is averaging 86.7 points per game. It will make for an interesting matchup on Thursday, as Montana’s rejuvenated offense goes up against the league’s top-rated defense. Sacramento State leads the Big Sky, with opponents averaging just 63.1 points per game while shooting .418 including .297 from three-point range (all three statistics are tops in the Big Sky and among the best in the NCAA, including 31st for scoring defense). The Hornets also rank in the top 40 nationally for steals, averaging 8.4 per game, led by Marcus Graves’ 2.20 per game (33rd in NCAA), and highly for rebounding. Sacramento State posed one of Montana’s toughest tests a year ago, taking the Grizzlies to overtime in Missoula. The two-point victory is Montana’s narrowest during its 19-game home winning streak. While the Hornets have a premier defense, their offense ranks second to last in the Big Sky with just 71.0 points per game. Meanwhile, Montana’s defense has been stout all season, with opponents averaging just 68.7 points against the Griz (111th in NCAA), including 64.1 during the month of December. Montana will be playing for the third time in six days while Sacramento State hasn’t played since Saturday, a 70-65 home loss to Northern Colorado. Montana has won three consecutive games, all on the road. Montana is 2-0 to begin Big Sky play for the fourth time in five seasons under Travis DeCuire. In seven games during the month of December, the Grizzlies allowed just 64.1 points per game. Montana is shooting .490 on the season (31st in NCAA, 1st in Big Sky) and has made at least half of its shots eight times. Montana is the only Big Sky team to have three players rank in the top 20 for scoring. Four different Grizzlies have scored at least 20 points in a game this season and three have made 10 or more field goals. Montana owns the nation’s fourth-longest home winning streak, winning 19 consecutive games inside Dahlberg Arena. Nine of Montana’s 13 games have been away from Missoula. Michael Oguine (131) needs six steals to match Kevin Kriswell and move into fifth place in school history for career steals. Jamar Akoh will play in his 100th career game on Thursday. He will be the fourth current Grizzly to reach the century mark for games played. Montana’s 7-4 non-conference record was its best since 2010-11, and came against the nation’s 43rd-toughest schedule. More impressive, the Grizzlies had their full roster available just twice, most notably being without all-conference forward Jamar Akoh for seven games. Montana has made at least eight three-pointers eight times this season. The Grizzlies hit that number just four times in 2017-18. The Grizzlies’ top-three free-throw percentages have come in the past four games. Just five opposing players all season have made more than five field goals against the Griz. Montana’s four losses have come to opponents with a combined record of 38-17 (.691). 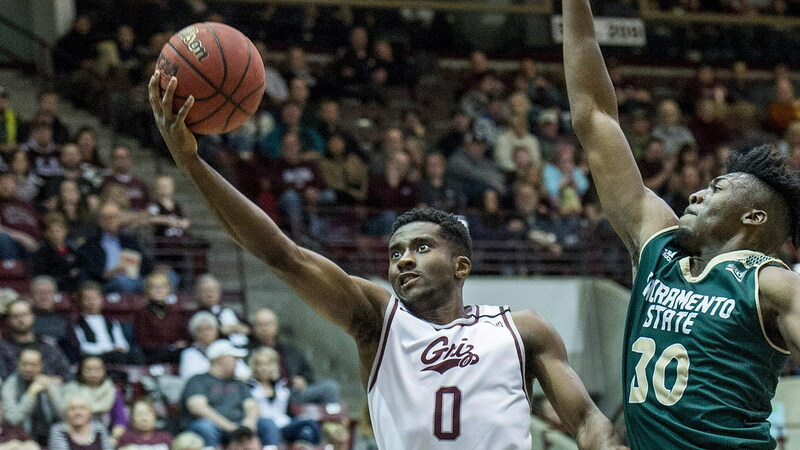 Montana has three players averaging at least 30.0 minutes played per game, led by Ahmaad Rorie, who ranks fourth in the Big Sky at 32.8. After being one of two teams to use the same starting lineup for every game in 2017-18, the Grizzlies have used four different combinations in 2018-19. However, they have used the same lineup in five of their past six games and are 6-1 when using their traditional lineup. Montana has out-rebounded its opponent in three consecutive games. While Montana’s 31.7 rebounding average is last in the Big Sky, the Grizzlies rank second by allowing just 32.8 rebounds per game. Montana’s 4-0 start was its best since 1995-96. Seven players have made their collegiate or Grizzly debuts. To little surprise, Montana is 5-0 on the year when leading at halftime. Perhaps unexpected, however, the Grizzlies have won three of the seven times they have trailed at the intermission. Six of Montana’s nine wins have been by double digits. The Grizzlies are 6-0 on the season when scoring at least 80 points, which they have done in each of the past three games. They are 9-2 when holding opponents under 80 points. Montana ranks 31st nationally for field-goal percentage and is 9-0 on the year when shooting a higher percentage than its opponent. The Grizzlies are 0-4 when shooting a lower percentage. Montana has out-rebounded its opponent in three consecutive games and is 6-0 on the year when doing so. The Grizzlies have posted more assists than their opponent in 10 of 13 games. The Grizzlies have turned the ball over more times than their opponent just three times in 13 games.